Happy Easter all! Of course I was going to post a Hot Cross Bun recipe. I found a great recipe by the bread baking king, Mr Paul Hollywood, on the BBC Good Food website. I’ve made some modifications (sorry Paul!) based on my taste preferences and what I had on hand and I think they’re just scrumdiddlyumptious! 1. Bring the milk to the boil, remove from the heat and then add the butter. Leave to cool until warm – it should still be warm to the touch, but not so hot it burns your hand. 2. Mix the flour, salt, sugar, yeast, cinnamon, nutmeg and mixed spice in a bowl. Make a well in the centre. Pour in the warm milk and butter mixture, then add the beaten egg. Use a metal table knife to mix until well incorporated, then bring everything together with your hands until you have a (very) sticky dough. 3. 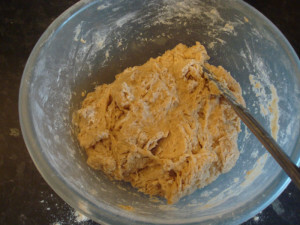 Turn the dough out on to a lightly floured surface and knead. Hold the dough with one hand and stretch it with the heel of your other hand, then fold it back on itself. Repeat for 5 mins until the dough is smooth and elastic. Though dough will still be a bit sticky at this point, but if it is too wet knead an extra tablespoon or two of flour into the dough. 4. Use 1TBS of sunflower oil to lightly oil a bowl. Put the dough in the oiled bowl. Cover with oiled cling film and leave to rise in a warm place for 1 hr or until doubled in size and a finger pressed into it leaves a dent. 5. 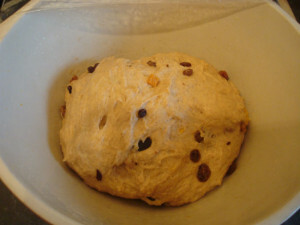 With the dough still in the bowl, add the sultanas, raisins, mixed peel, lemon zest. Knead into the dough, making sure everything is well distributed. I added half the dried fruits and kneaded, then the other half and kneaded again to ensure even distribution. Leave to the dough to rise in a warm place for 1 hr more, or until doubled in size, again covered by some well-oiled cling film. 6. Divide the dough into about 14 even pieces, approx 75g per piece (yes, I did weigh each piece). With lightly floured hands, roll each piece into a smooth ball. 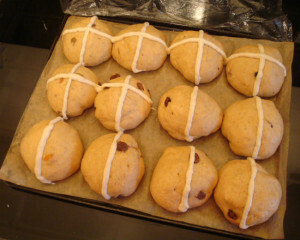 Arrange the buns on one or two baking trays lined with parchment paper. Remember to leave enough space for the dough to expand. Cover (but don’t wrap) with more oiled cling film, then leave in a warm place to rise for about 1 hr more. 7. Preheat your oven to 425F/220C fan/gas 7. Mix the plain flour with about 6 tbsp water to make the paste for the cross – add the water 1 tbsp at a time until you reach the right consistency. Spoon into a piping bag fitted with a small nozzle (a No.6 for the serious bakers out there!). If you don’t have any piping bags, you can make one out of parchment paper and snip a hole at the end (see here: http://www.youtube.com/watch?v=f-622YocQv4). 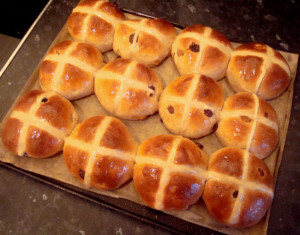 Pipe a line along each row of buns, then repeat in the other direction to create crosses. Bake for 20 mins on the middle shelf of the oven, until golden brown. 8. Make the glaze by gently dissolving the sugar in a pot of water on the stove. Leave to boil for an additional 30 seconds. Remove from heat and use a pastry brush to glaze the buns. Leave to cool and enjoy! Let me know if you enjoyed this hot cross bun recipe in the comments and please don’t forget to click the “thumbs up” button below!